Students under the age of 21 are required to live on-campus unless they are formally exempt and are residing with their parent(s), legal guardian(s) or spouse. This policy applies to all students (first year, sophomore, junior, international and transfer) that are under the age of 21. Academic credit hours and/or class status do not exempt you from this policy. All requests for exemption must go through Kate Zanger, Vice President of Student Life. Housing and dining plans are valuable to college students. are more likely to persist in college and complete their baccalaureate degree in four years. are more likely to earn professional degrees. are more likely to achieve a higher grade point average than those who reside off-campus. report that they have greater satisfaction with their living environment. are regarded as having a more positive self-image, with enhanced self-confidence, public speaking ability, and similar measures of self-reliance. report to participate in more extra-curricular activities. You are part of the family! Eat at the table with everyone else and be a part of all campus activities. This is your home. Learning outside of the classroom. Researchers estimate that 70% of campus time is spent outside of the classroom. 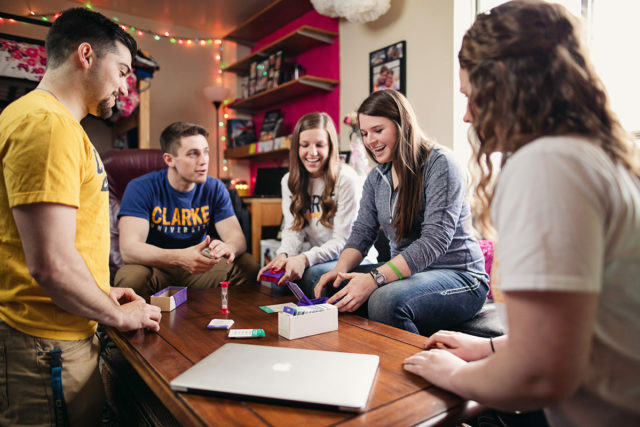 Much of this engaged learning takes place in the residence halls where students are challenged by major questions in life, are learning about themselves and how to live well with others. Living on-campus allows students to transition between adolescence into adulthood in a safe environment. Remain connected. The spontaneous activities that residents participate in, like midnight trips to Taco Bell or impromptu sledding after a big snowstorm, are more fun with 30-60 floor mates. Additionally, need a study partner? Check next door! You will graduate! National research indicates that students who live on campus have a higher retention rate than those who reside off campus. Sweet memories. When you ask people about their college experience or hear stories, they tell stories involving friends, dorm life, growth and challenges all of which often happen in the formative environment of living on-campus.